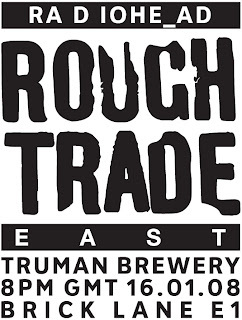 Radiohead playing small gig at Rough Trade TONIGHT! "For those who can't get in - and it's pretty small in there - we'll have some screens and speakers outside, if we're allowed. I think we are. And we'll also webcast it. I'll put the link up here, as well as any other info, later today." If you do go tonight, would be great to hear all about it. I noticed you linked to my site -- thanks! I gave you a link on mine as well :) Cheers!